Pottage and Evans (1992) argue that: ‘A shift from the traditional view of stress as a personal problem located in individuals, towards seeing it as an indicator of the ineffectiveness of work environments, systems and practices is necessary’ (pp. 12–13). This is very much in line with the perspective we have adopted here, based on the view that stress is both an individual problem and an organisational one. Indeed, as our discussions in Chapter 4 suggested, we would even go so far as to say that it is a social and political matter. 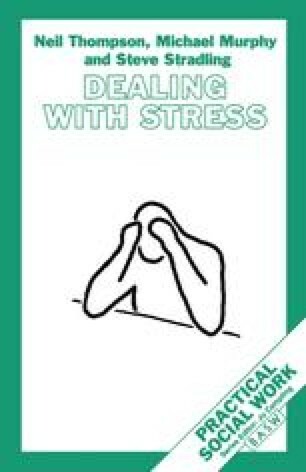 This chapter therefore examines those aspects of stress which are related to the organisations in which social work staff work. In particular, the focus is on those factors within the organisational context which, depending on how they are handled, can either assist staff in dealing with their pressures, or actually contribute to making those pressures overspill into stress. As McDerment (1988) points out: ‘Organizational contributors to individual suffering cannot be emphasised enough’ (p. 44).